If you have not done so already, you are encouraged to watch Aaron Russo's America: Freedom To Fascism, a film that has opened the eyes of millions of Americans. 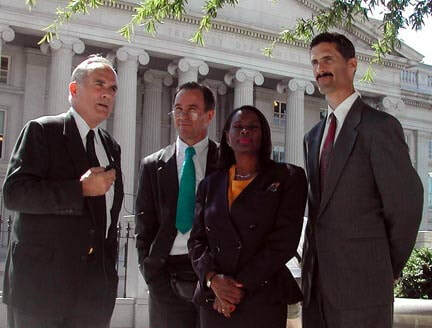 Russo's film follows Joe and other former IRS agents, whistleblowers and experts as they investigate the true scope and nature of the federal income tax system. Joe is working on various projects that will provide greater and more rapid access to his quarter century of expertise with protection of rights, privacy enhancement and tax administration, including “Operation Innocence Revealed“. A video presentation called “Innocence Revealed“, featuring five attorneys and myself, explains key facts and reasons why people sincerely and legitimately come to believe no law has ever been passed by Congress and signed by the President requiring the average American living and working in the United States of America to file federal income tax returns or pay federal income tax. The first step, if you haven’t done so already, is to review Joe’s whistleblowing efforts to familiarize yourself with evidence of his history, character and intentions. You can also view a large video and audio library here. The next step is to join Joe’s email list by entering your email address on the right-hand side of the web page linked here to receive the latest updates on his efforts to stop the dishonest administration and enforcement of the federal income tax system, enhance Americans ability to preserve their privacy, their property and their life. In the event you become disgusted and/or angry once you have learned more about how the federal government and “mainstream media” have lied to the American people about their true federal income tax obligations, remember to exercise the utmost caution as outlined in these precautionary considerations.